Venom not scratching that symbiote itch? 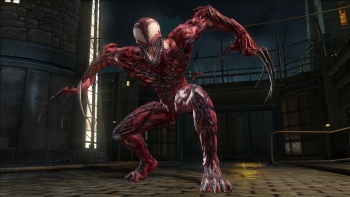 Why not try Carnage on for size? Marvel Comics has a huge stable of characters, some of them better than others admittedly, but it means that when a game like Marvel: Ultimate Alliance 2 gets made, some people are inevitably left out. That's where DLC steps in, bringing you all the heroes - and villains - that didn't quite make the grade first time round. The first DLC for the game is undoubtedly a villainous one however, as it adds the utterly psychopathic Carnage to the game. "Just to be as mean, savage, and up-close-and-personal as possible. All his attacks are really nasty. Carnage is out to hurt people, and he doesn't care about collateral damage along the way. We carried this mentality throughout all aspects of his design ... We really wanted to play up the idea of a killing machine that simply did not stop," said Justin Heisler, one of the game's designers.